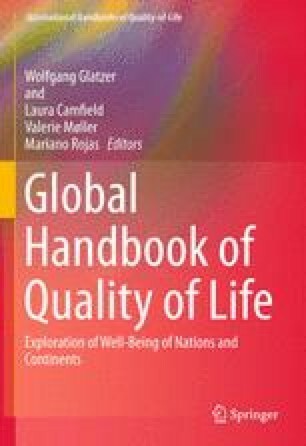 This chapter challenges the apparent contradiction between wellbeing and ecological sustainability based on the non-satiation and individualist maximization assumptions in conventional economics. It focusses on sustainable consumption, first because consumption and wellbeing are intimately related and second because consumption in the rich and emerging countries is contributing to a number of serious environmental problems, including climate change. Evidence from wellbeing research suggests that the relationship between consumption and wellbeing is neither lineal nor positive, and that individual’s wellbeing is highly correlated with that of friends, family and the environment. This evidence supports a reconceptualization of the relationship between consumption and wellbeing that draws on an alternative approach that encompasses the social, economic, technological, natural and political contexts that support habitual behavior. Once the importance of habits is acknowledged, sustainability research and policy need to be rethought to investigate societal processes, such as the ones currently at work in transition towns, which have the potential to promote both wellbeing and the environment. Daly, H. (2008). A steady-state economy. Sustainable development commission reports and pieces. http://www.sd-commission.org.uk/publications.php?id=775. Accessed 2 July 2013. Wellbeing in Developing countries (WeD). (2007). Research statement. http://www.welldev.org.uk/research/aims.htm. Accessed 5 July 2013.